Moffat County High School's Josie Timmer takes a leap in the triple jump Friday at the CHSAA State Championships. 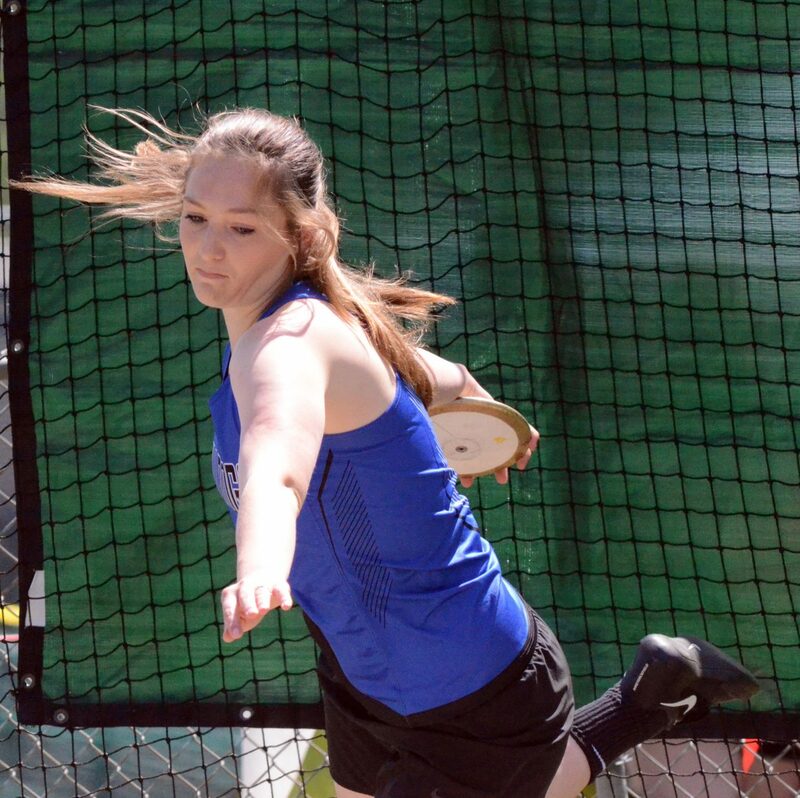 Moffat County High School's Caylah Million makes it to the podium for ninth place in the discus throw Friday at the CHSAA State Championships. 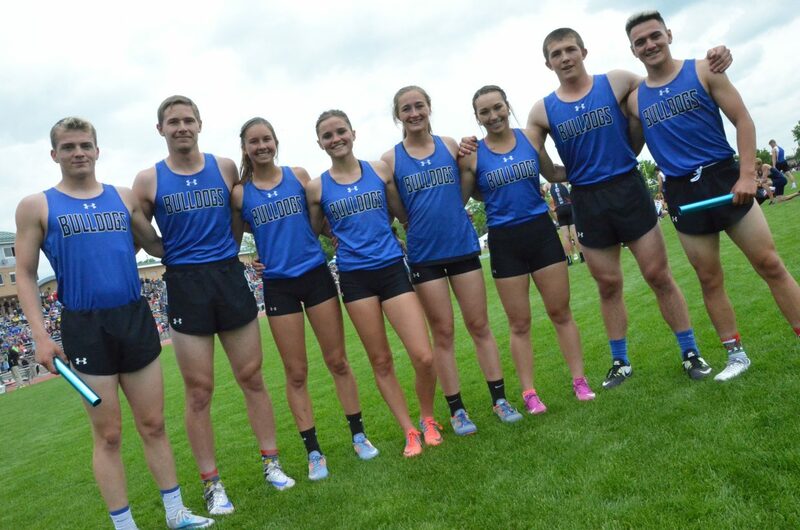 From left, Moffat County High School relay runners Jared Atkin, Miki Klimper, Emaleigh Papierski, Stephenie Swindler, Josie Timmer, Quinn Pinnt, Elias Peroulis and Victor Silva gather following the 4x200-meter relay finals Friday at the CHSAA State Championships. 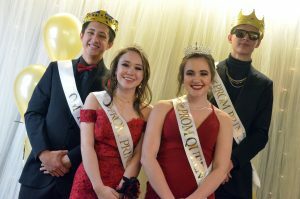 Clockwise from top left, Moffat County High School's Elias Peroulis, Miki Klimper, Victor Silva and Jared Atkin display their sixth-place medals for the 4x200-meter relay Friday at the CHSAA State Championships. 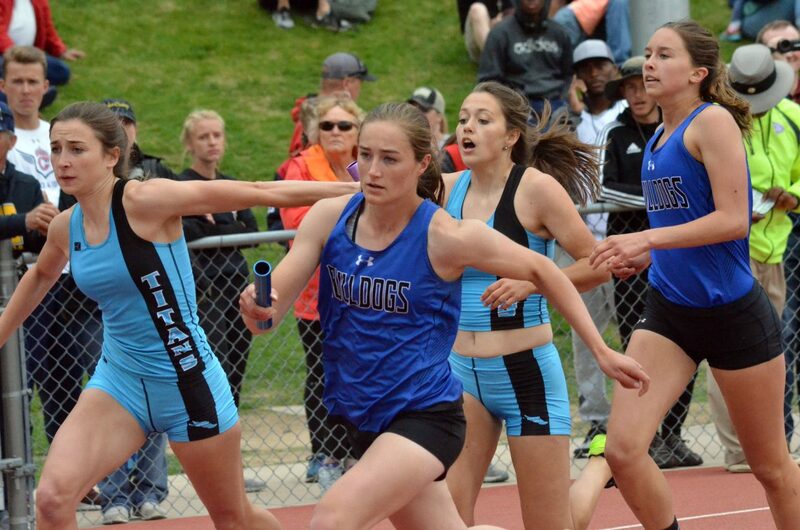 Clockwise from top left, Moffat County High School's Quinn Pinnt, Josie Timmer, Emaleigh Papierski and Stephenie Swindler take the bronze in the 4x200-meter relay Friday at the CHSAA State Championships. Moffat County High School's Caylah Million gets ready for a release in the discus throw Friday at the CHSAA State Championships. 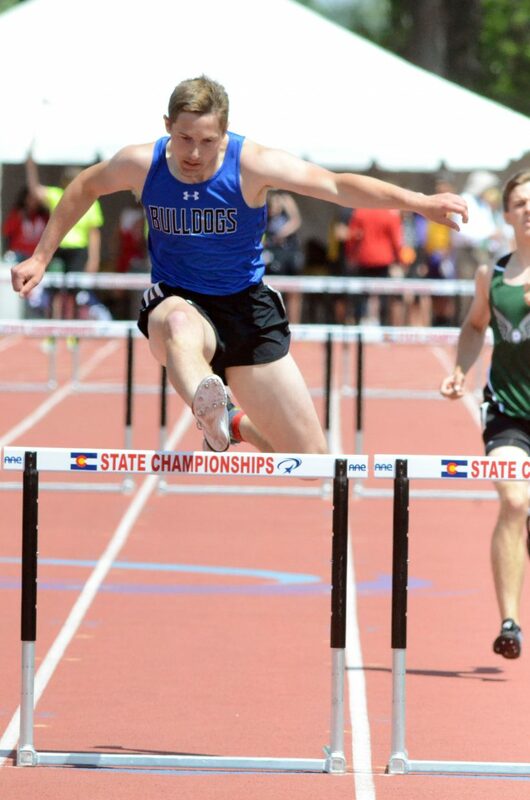 Moffat County High School's Miki Klimper takes his final hop before the finish line in the 300-meter hurdles preliminaries Friday at the CHSAA State Championships. Moffat County High School's Victor Silva comes off the starting blocks in the 4x200-meter relay Friday at the CHSAA State Championships. 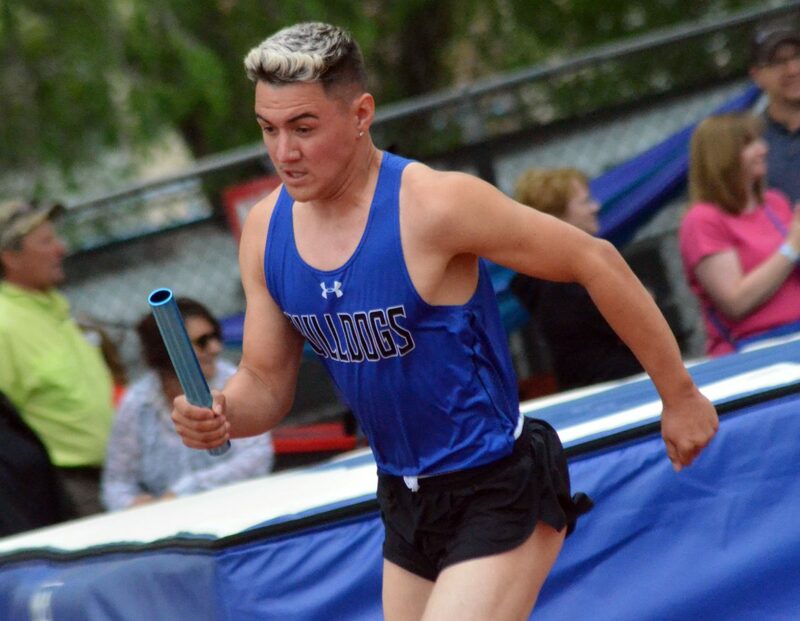 Moffat County High School's Jared Atkin, left, grabs the baton from Elias Peroulis to start the second leg of the 4x100-meter relay preliminaries Friday at the CHSAA State Championships. 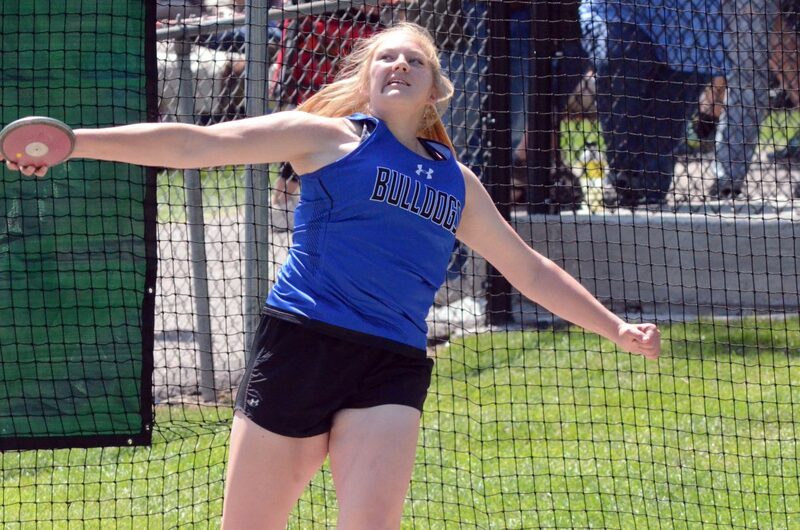 Moffat County High School's Tiffany Hildebrandt starts her spin in the discus throw Friday at the CHSAA State Championships. 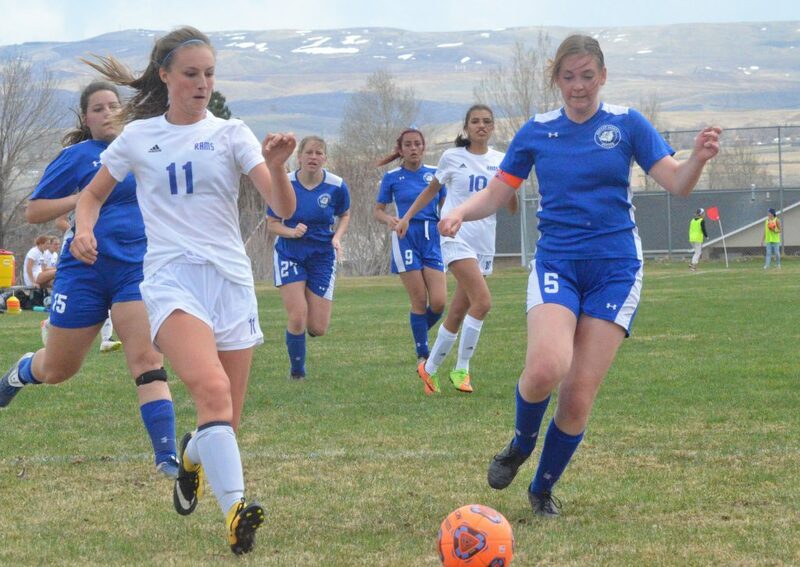 Moffat County High School's Josie Timmer looks to stay in front of Coal Ridge competition after the handoff from Emaleigh Papierski in the 4x200-meter relay Friday at the CHSAA State Championships. 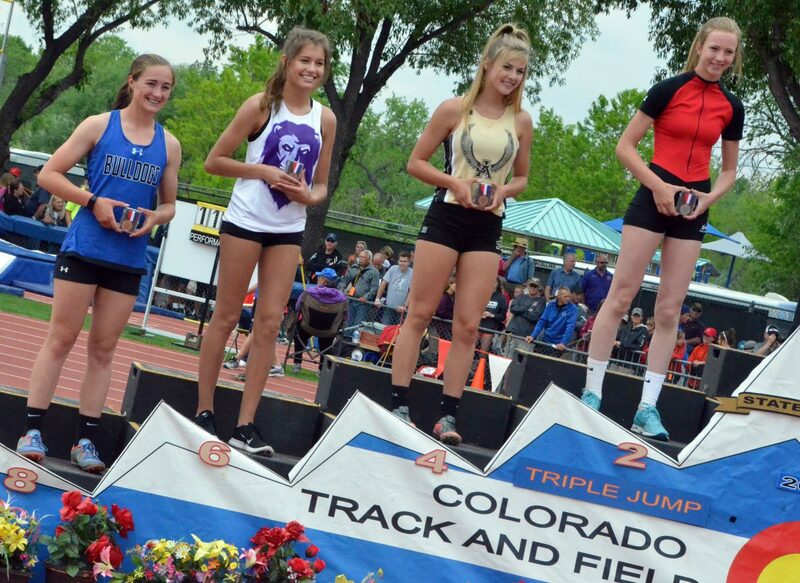 Moffat County High School's Josie Timmer smiles with her eighth-place honors for the triple jump Friday at the CHSAA State Championships. 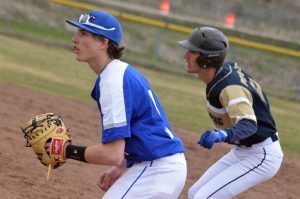 LAKEWOOD — When it comes to the final track and field meet of the season, the time is never better for athletes to demonstrate they can continue to improve, and Moffat County High School proved it again and again Friday at the midway point of the CHSAA State Championships. 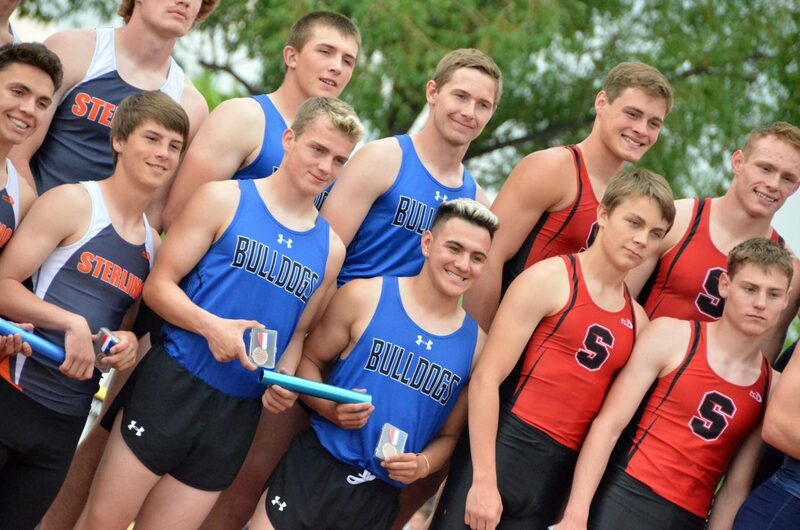 Bulldogs were repeat visitors to the finalists’ podium during the second day at state, some of whom were more than a little surprised to make it that far. Then again, some weren’t shocked at all. Such was the case of the boys 4×200-meter relay team, who wrapped the afternoon standing in the sixth place spot of the podium. Victor Silva, Elias Peroulis, Jared Atkin and Miki Klimper narrowed the gap and shortened their best time during the Thursday preliminaries by moving up the ranks from 13th to just inside the finals at ninth. But, they weren’t done yet. 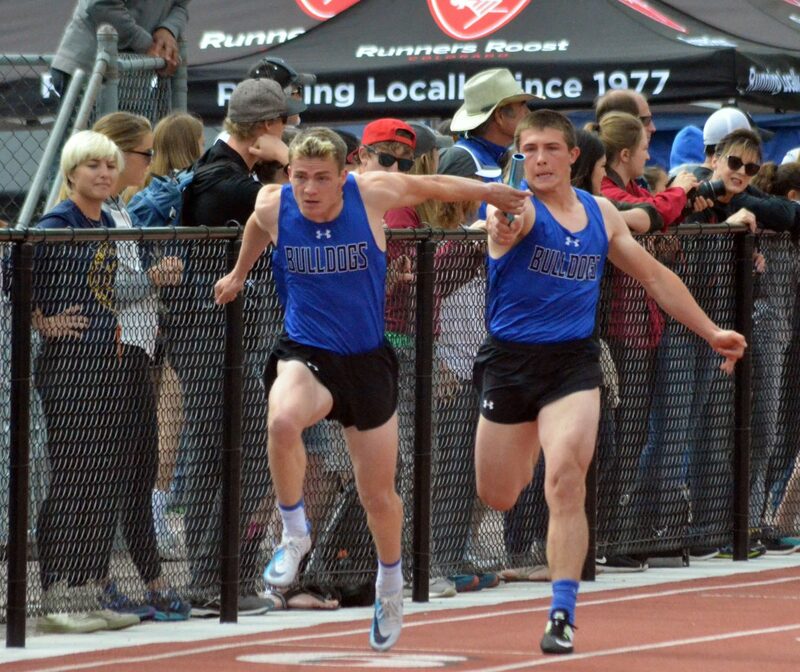 Setting their sights on a win may have been unrealistic — especially since Lutheran won the event with a 3A state meet record — but the Dogs kept the momentum going to hit their lowest time to date at 1:31.96. “It’s just our teamwork, some really great handoffs,” said Klimper, who also made it to finals in 300 hurdles, ranked seventh following prelims. Atkin also was set up for the 300 prelims but had a false start. The 4×200 finish was no small feat, but the same quartet of Silva, Peroulis, Atkin and Klimper had showed earlier in the day that prelim rankings are hardly set in stone. After sneaking onto the state list at 17th in 4×100 at an even 45 seconds, the group brought it down to 44.12 to continue on to the Saturday finals. 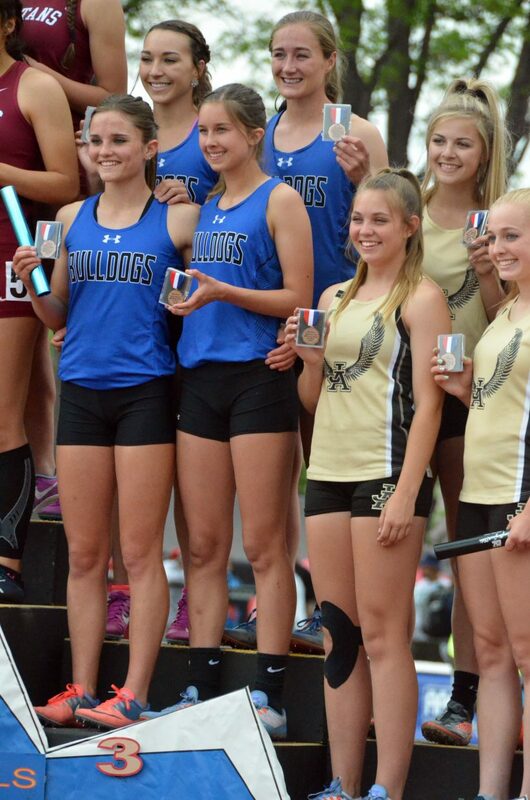 As for the girls 4×200 team, Stephenie Swindler, Emaleigh Papierski, Josie Timmer and Quinn Pinnt finished right where they were seeded, though certainly with no complaints, as the group picked up bronze medals with third place, Moffat County’s highest placement yet during the three-day state championships. Bringing their season best down to 1:46.48 didn’t hurt either. Timmer warmed up for the relay earlier in the day on the triple jump runway, right on the cusp of podium placement as the ninth seed. 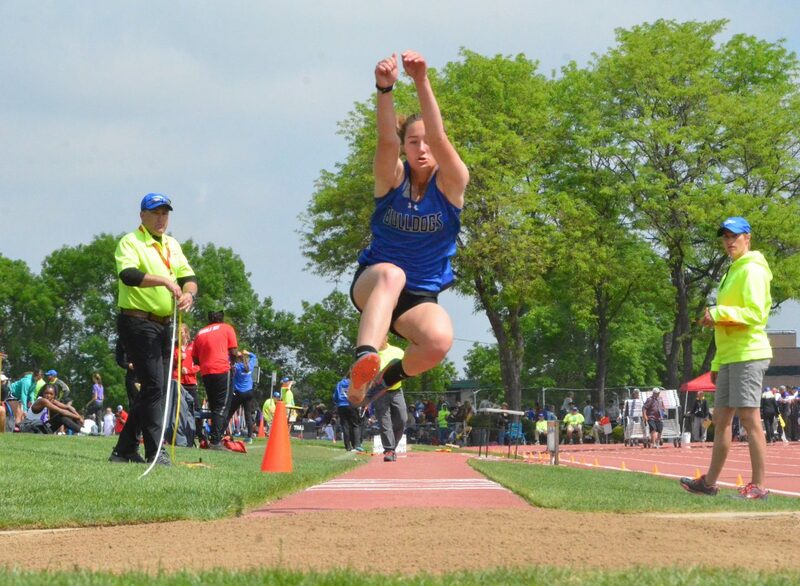 A jump of 34 feet, 2.25 inches in the initial got her into the finals, but it wasn’t until her final leap of the day and her high school career that she hit her season-best wind-legal distance of 34′ 7″ — earning a wind-aided 34′ 9″ at the Tiger Invite the week before — placing eighth in the state. 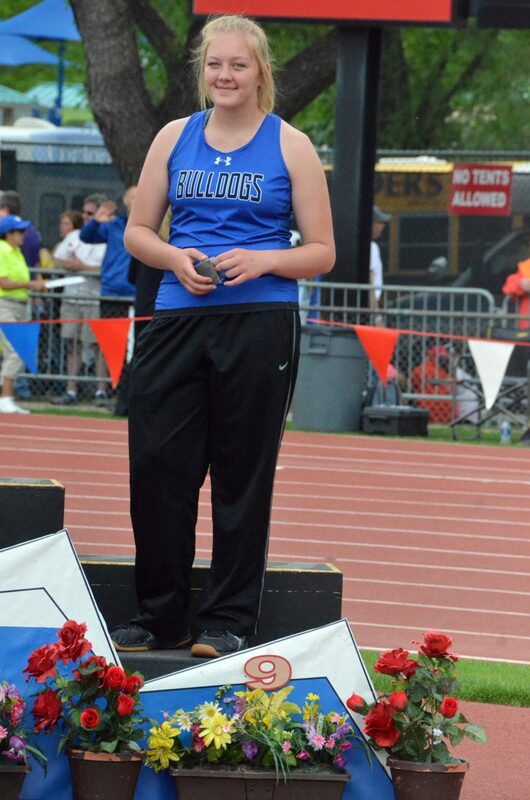 Timmer, who plans to walk on to the track team at Kansas’s Fort Hays State University, said this year was a vast improvement from the previous season ender at state, where she made it to state but didn’t place. “I wasn’t near as nervous. 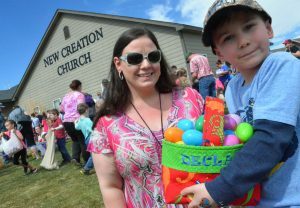 I felt a lot more comfortable and relaxed,” she said. On the other end of Jeffco Stadium, MCHS throwers Caylah Million and Tiffany Hildebrandt were looking to move up the ranks in the discus, seeded 16th and 18th, respectively. Hildebrandt ultimately took 11th at 103′ 8″, while Million’s 106′ 2″ pushed her into finals. Million noted the unusual amount of spectators for the throwing events compared to earlier in the season. 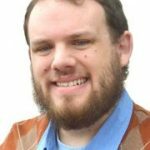 “There’s so many people, and I’ve never seen that many people turn out to watch discus. It’s crazy,” she said. Though two of her last three throws were fouls, she ended her day with a new personal best of 109′ 8″ and ninth place. She added that a back-and-forth, friendly rivalry with Hildebrandt has brought out the best in both of them, and either of them could have wound up placing. 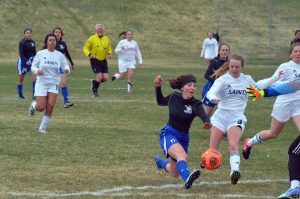 “No matter who’s doing better at the time, at the end of the day, we push each other,” she said.